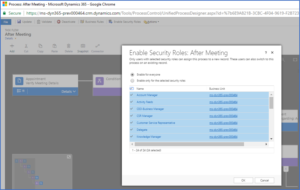 In the upgrade to Microsoft Dynamics 365, Admins or users who can customize Business Process Flows will notice a new way to manage changes to Microsoft Dynamics 365 security roles. In earlier versions of CRM (2013-2016) the option in Dynamics CRM was to open a Business Process Flow, then chose “Enable Security Roles” in the ribbon. Post upgrade, Security controls for certain Business Process Flows have moved to their own tab in the “Security Roles” area in Settings. 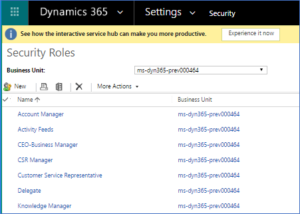 To control Security for your non-activity Microsoft Dynamics 365 Business Process Flows, go to Settings > Security > Security Roles. Then select the Security Role to work with. Open the role and now there’s a tab for Microsoft Dynamics 365 Business Process Flows, which is where you can enable and disable the read/write/delete functions. Be sure to name the roles appropriately going forward as there’s less detail here than on the Process Views in Settings. Certain Process Security did not change, as noted by the table above. For any TBX (Task Flows) you will still find the option in the window where you can edit and work with the Process. This may add steps to controlling Microsoft Dynamics 365 Security Roles, depending on your org’s needs, but a straightforward change once you know where to look! By Erin Karatkiewicz, Application Consultant, Dyn365Pros, Microsoft Dynamics 365 Partner, San Diego, Southern California.